Suzanne Siebert is a technical writer and technical consultant in the field of intellectual property with degrees in chemistry and law. Following her B.A. in chemistry from the University of California at Berkeley, she worked six years as a technical writer for a high vacuum and electronics company. She cofounded an intellectual property law firm in San Francisco in 1982. While practicing as a patent and trademark attorney she wrote hundreds of chemical, biochemical, and pharmaceutical patents for clients, including The University of California, Stanford University, Hewlett Packard and The Clorox Company, and assisted The University of California, The Clorox Company and other clients in protecting their trademarks. Suzanne is now on inactive practice with the California State Bar. Since establishing Symbolic Solutions in 2001 she has worked with scientists to analyze and organize their technical and research information and to create text and illustrations for documentation, product manuals and client brochures. She provides technical consulting services for the intellectual property portfolios of a select number of sophisticated clients. She particularly enjoys working with artists and musicians. See, for example, eastbayrecorders and guensublette. 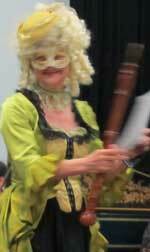 She plays period woodwinds with the Baroque ensemble Divertimenti, and also has or presently serves on the Boards of various non-profit organizations in the San Franciso Bay Area.